Some people prefer utter silence as they kayak down a river. The ambient sounds of birds flapping their wings or water whooshing beneath them is sufficient. Others, however, might opt for a little music. Or how about some eerie, underwater sounds that can help scientists track pollution and climate change? Since 2014, researchers in the United Kingdom have been working on Sonic Kayak, a kayak rigged with a system of data loggers and speakers that allows paddlers to make music themselves—with the help of nature, of course. The data these kayaks pull can also help scientists learn more about the underwater ecosystems they ride over. Researchers revealed this work in a paper published in the journal PLOS Biology Thursday. These kayaks are equipped with special tech: Underwater hydrophones to record sounds of wildlife or boats, and digital thermometers that monitor the temperature of the water. Speakers convert the water temperature into pitch, with a higher pitch indicating a higher temp. All these sounds are, then, layered on top of each other to create one dope, trippy track. There’s another element, too. Hear that weird, robotic voice? Those are GPS-triggered sounds. 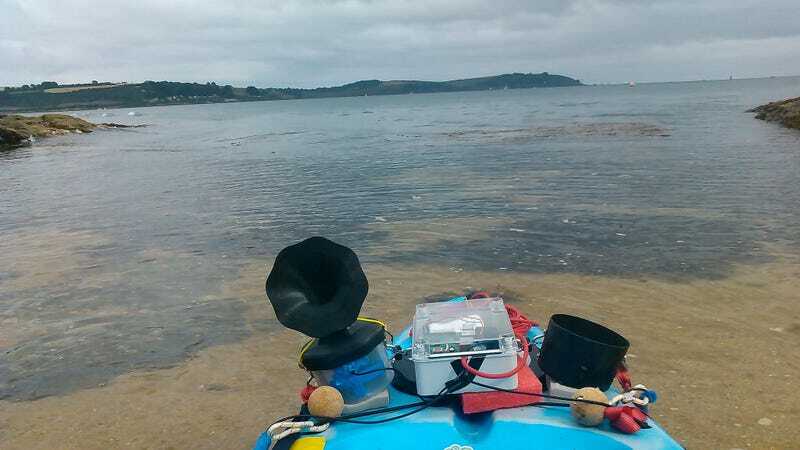 The teams with FoAM Kernow, a lab whose work blends art and science, and the Bicrophonic Research Institute demonstrated the system by launching kayaks at the B2016 British Science Festival in Swansea, United Kingdom. Different parts of Swansea Bay were marked as different zones, and switching zones triggers a sound. Depending on what zone of the Bay kayakers cross, they might hear a variety of sounds: poetry or beats or electronic voices. The voices tell factual messages about climate change. The poetry also related to climate change and the sea. The musical beats gave riders a break from information. Sometimes, people just want to bob their heads, man. The GPS sounds are a legacy of the Sonic Bikes, a technology the Bicrophonic Research Institute team finalized in 2010 that plays different music depending on where a cyclist rides. “The Sonic Bike creates an outdoor listening experience for all; the antithesis of headphones—the cyclist becomes a performer and the passers-by, the audience,” per the research paper. That’s part of what makes this project so freaking cool. The acoustic data riders log has the potential to help researchers track marine noise pollution and signs of climate change, according to the research article. Underwater sounds that come from, say, commercial shipping, threaten marine life. In theory, Sonic Kayak can be a more interactive—and less invasive—way to document these sounds. As for climate research, monitoring sea temperatures helps scientists understand coastal ecosystems. These kayaks can help create “fine-scale temperature maps” that’ll allow scientists see how climate change is impacting nearby fish species and their breeding habits, as well as underwater flora like algae. Sonic Kayak is a manifestation of several minds: The project was developed, in part, during open hack lab events. Now that the team is sharing the research on an open-access journal and have made the design open-source, they’re inviting even more people to learn about it—and build upon it. One person at the University of Exeter already is looking to use this data to study fish breeding in estuaries, according to this video. There’s nowhere consumers can buy the product—yet—but with all the information laid out online, people can get the audio equipment together and fit their personal kayaks for data gathering. That’s citizen science right there.